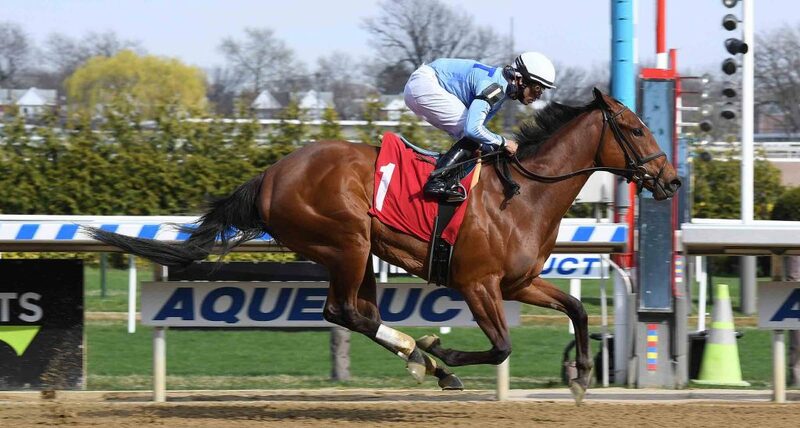 Finely tuned for her return by trainer Chad Brown, Peter Brant’s idle five-year-old New York-bred mare Fifty Five made a sensational return from a near-six-month layoff under Irad Ortiz Jr. Sunday afternoon at Aqueduct. 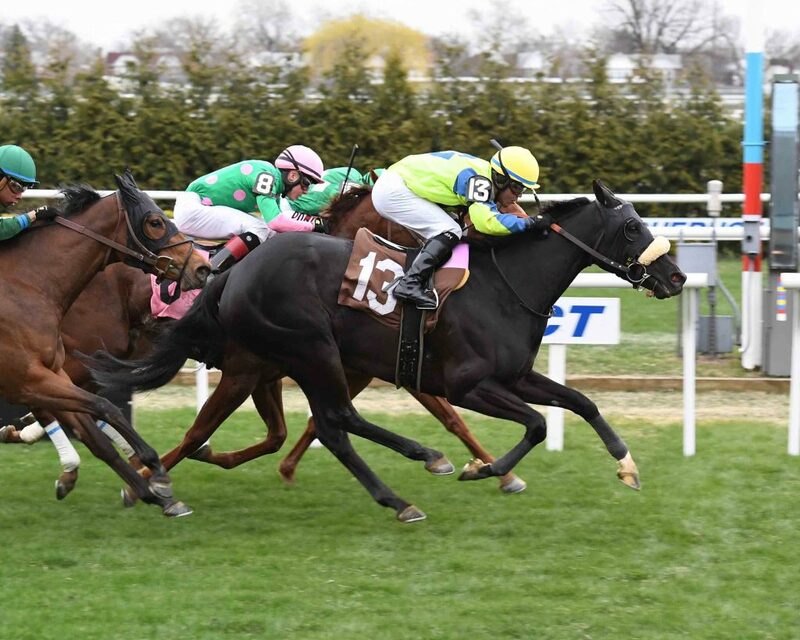 Rallying from last in a field of five, Fifty Five scored her third consecutive victory, taking the one-mile $100,000 Plenty of Grace Stakes, a race she finished second by a length in a year ago, by nearly two lengths. Sent off at 1-2 odds from the rail, Fifty Five won in a final time of 1:36.10 on the “good” inner turf course. 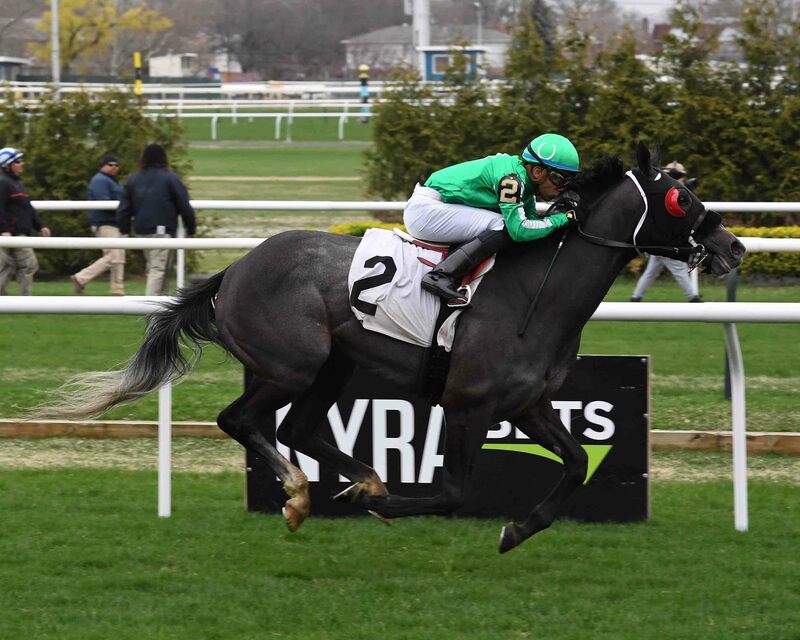 Conquest Hardaway, sent off at odds of 12-1 under Dylan Davis, completed a New York-bred exacta, finishing second, a half-length ahead of 5-2 Thais (FR) and Manny Franco. 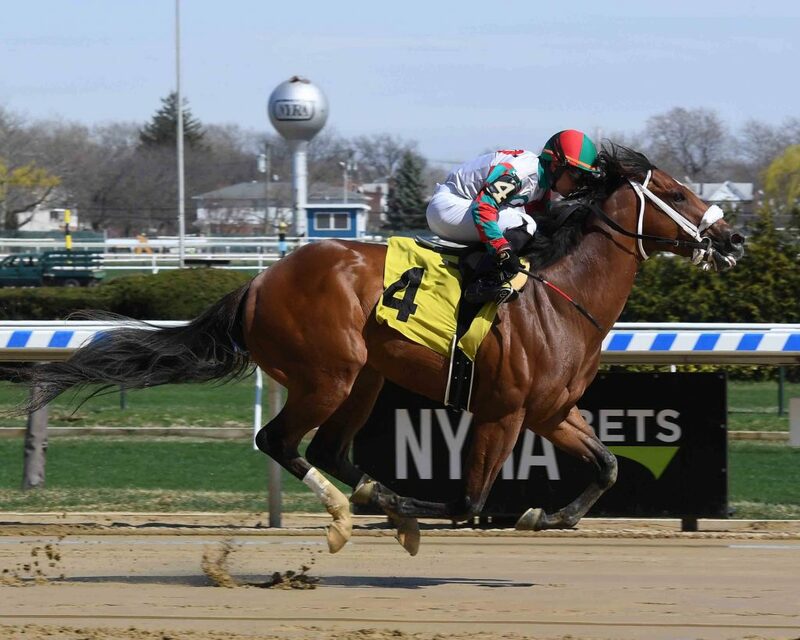 Empire Equines bred Fifty Five, a daughter of Get Stormy out of Soave by Brahms who hadn’t raced since October 20th, when she followed her two-length victory in the John Hettinger Stakes with a one-length score in the Ticonderoga Stakes on New York-bred Showcase Day. Brown couldn’t have done a better job getting his incredibly consistent mare, who has now finished in the money in 15 of her 16 grass starts, ready for her return. Ortiz let Fifty Five settle in last as 7-1 Coffee Crush and Jose Lezcano took the field through splits of :23.44, :47.55 and 1:11.62. Ortiz had rallied Fifty Five into fourth by then, and he angled her to the outside for a clear run. Once clear, she uncorked an impressive run, quickly taking the lead and extending it. She won comfortably. Fifty Five is now eight-for-17 in her all-grass career, with two seconds, five thirds and earnings of more than $710,000. 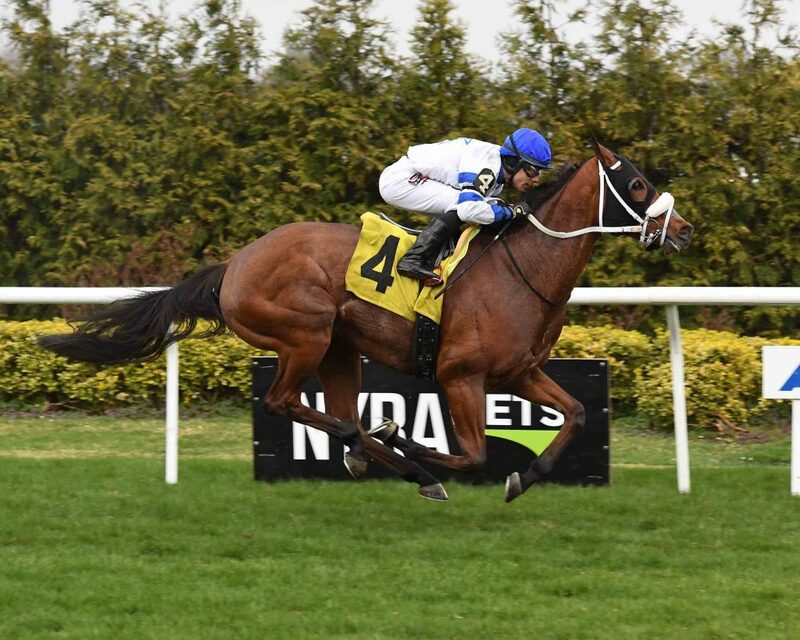 He may have given his backers at odds of 1-5 a tad of concern early, but Bass Racing’s freshened Gulfstream Park shipper Fort Worth made his New York-bred debut a winning one, taking charge in mid-stretch under Manny Franco and powering away to a 6 ¾-length victory in Sunday’s opener, a one-mile $62,000 New York-bred maiden special weight. Taken in-hand late, Fort Worth won in a final time of 1:36.44. 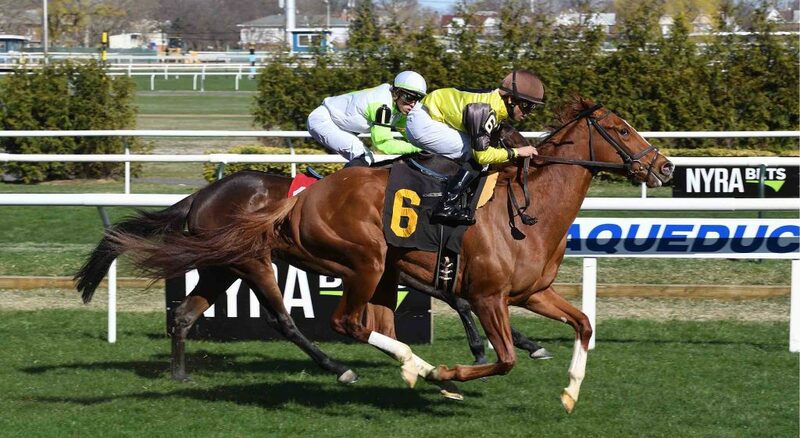 Red Zinger, who was adding blinkers and went off at 5-1 odds, finished a well-clear second, nearly 15 lengths ahead of 30-1 He’smyluckyfellow and Rajiv Maragh. Papa Jim, also sent off at odds of 5-1 from the rail under Dylan Davis, was just another head back in fourth. Danzel Brendenmuel and Clock Z Racing Stable bred Fort Worth, a son of City Zip out of Auspicious by Indian Charlie who sold for $550,000 as a two-year-old in March 2018 and is trained by Todd Pletcher. Fort Worth was making just his second career start after finishing third by 5 ¾ lengths at 3-5 odds in his open-company maiden debut under John Velazquez on February 16th. Fort Worth drilled four consecutive bullet works for his return, and he didn’t disappoint. Fort Worth broke sharply from the two post, but Franco took a hold of him and settled him in third, allowing Papa Jim and Red Zinger to duke it out on the front end through an opening quarter-mile in :23.01 and a fast half-mile in :45.47. Red Zinger put away Papa Jim and opened a two-length advantage before Fort Worth came calling for the lead. Fort Worth blew past Red Zinger and opened up quickly before being taken in-hand late. With a win and a third to begin his career, Fort Worth has earned more than $35,000. 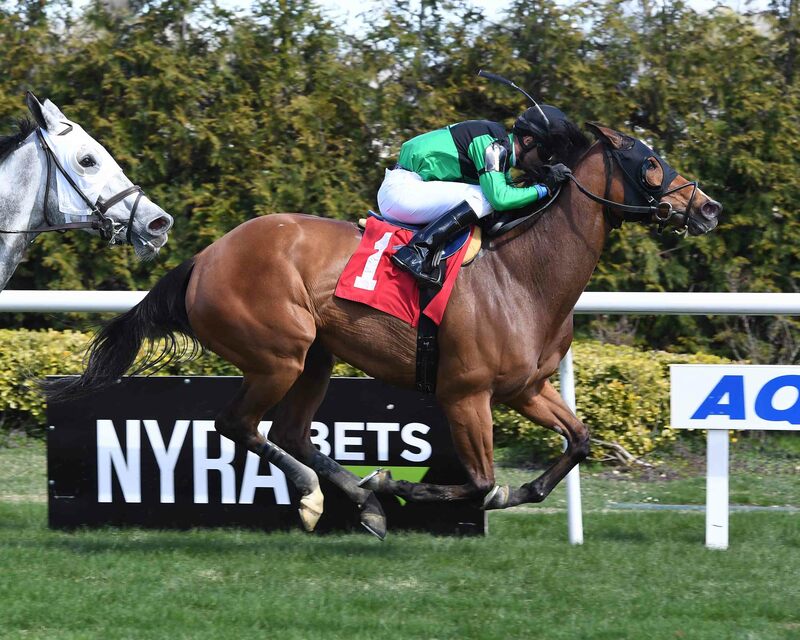 Despite racing wide the entire trip, co-owner/trainer Rick Schosberg and Clear Star Stable’s idle Ruvies in Time took a six-furlong $55,000 New York-bred starter allowance/optional $60,000 claimer for three-year-old fillies Sunday by 3 ½ lengths under Eric Cancel. Sent off at 19-1 odds in the field of six, Ruvies in Time won in a final time of 1:12.15. Warrens Vengeance, who was shedding blinkers and went off at 3-1 odds with seven-pound apprentice Benjamin Hernandez up, finished second, 3 ½ lengths ahead of 7-2 Stabilize and Manny Franco. Quietude, sent off at odds of 5-2 under seven-pound apprentice Joey Martinez, finished fourth, a length and three-quarters behind Stabilize. 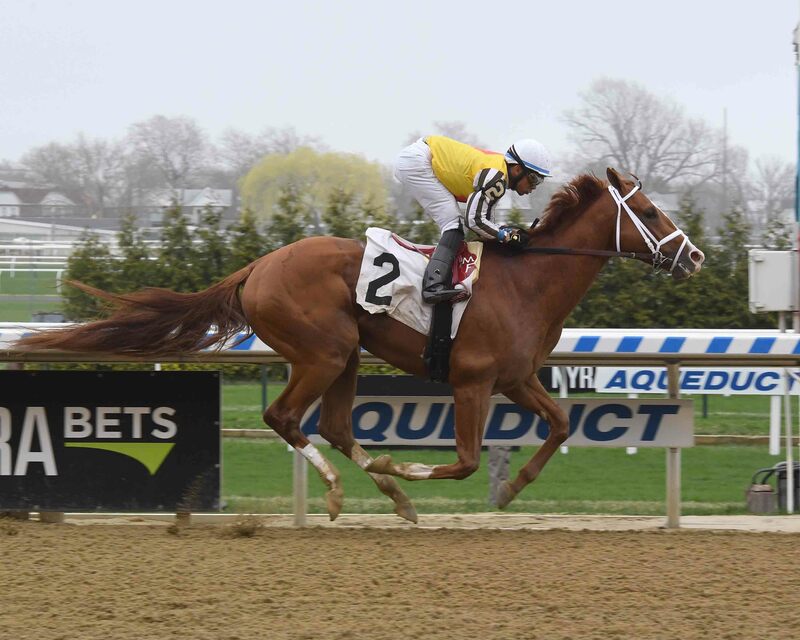 Mashnee Stables and Steve Schuster bred Ruvies in Time, a daughter of The Factor out of Hollywood Redhead by Tapit who sold for $95,000 as a two-year-old in May 2018. Ruvies in Time hadn’t raced since December 30th, when she finished third in an open starter allowance/optional $60,000 claimer under Cancel. Schosberg gave her plenty of time to recover, and she came back running. Cancel let Ruvies in Time linger in last as 9-5 Diamond Princess and Junior Alvarado set the pace under heavy pressure from 11-1 Ok Honey and Dylan Davis through an opening quarter-mile in :23.29 and a half-mile in :47.08. By then, Ruvies in Time had rallied three-wide into third. 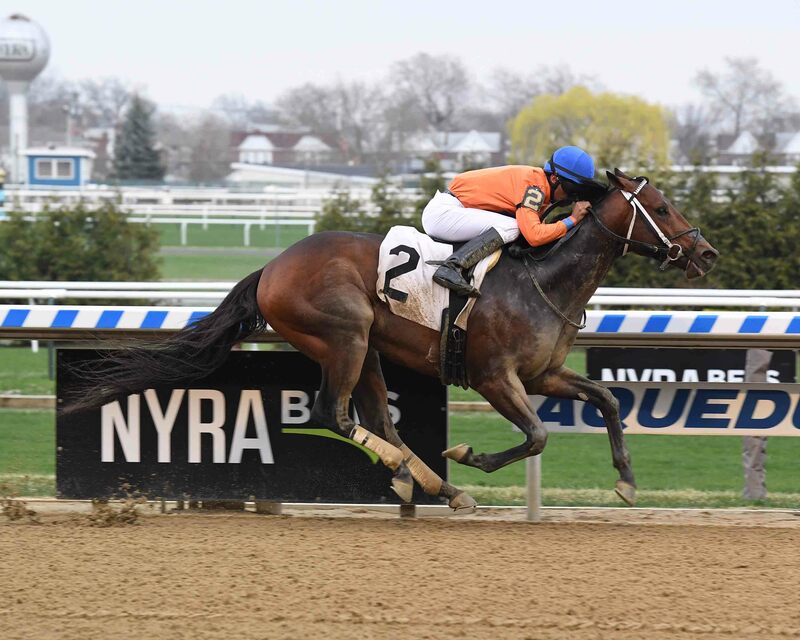 Ruvies in Time maintained her momentum, opened a safe lead and maintained it through the stretch. 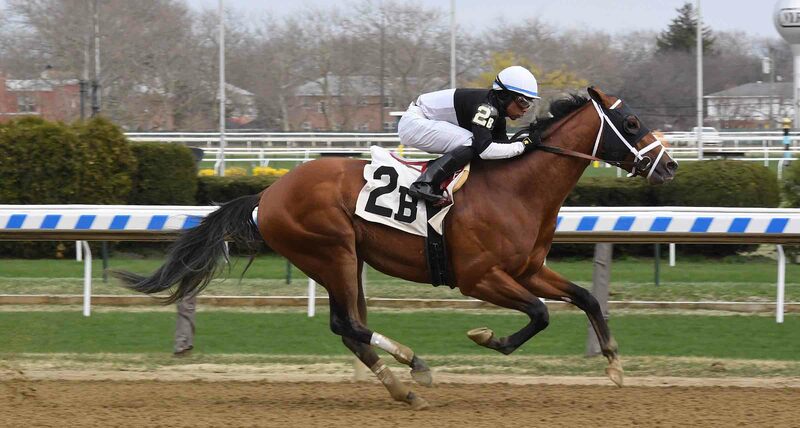 Ruvies in Time is now two-for-six on dirt with earnings of more than $60,000. 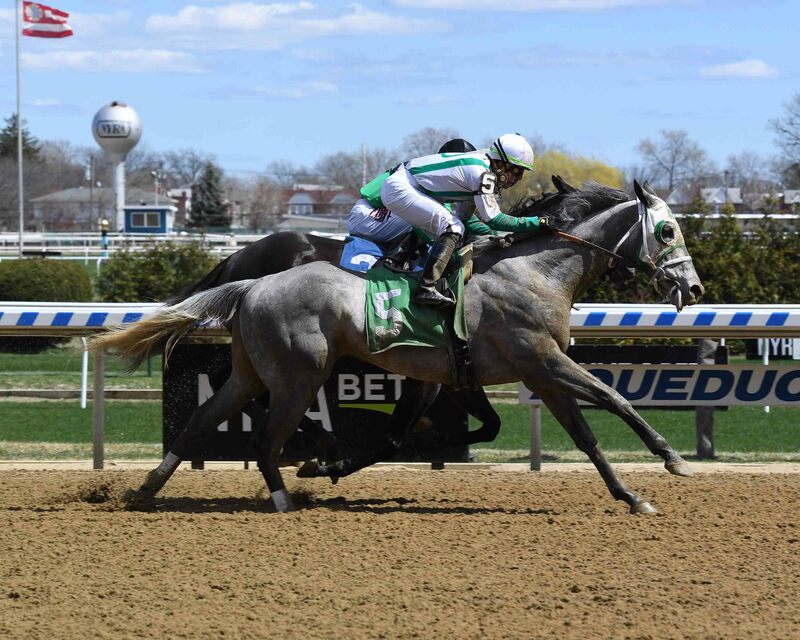 With a powerful, sweeping rally around the far turn under Manny Franco, Michael Boylan’s freshened three-year-old gray gelding Monaghan made his turf debut a memorable one, winning a mile-and-a-sixteenth $41,000 New York-bred maiden $40,000 claimer on the grass by three lengths. 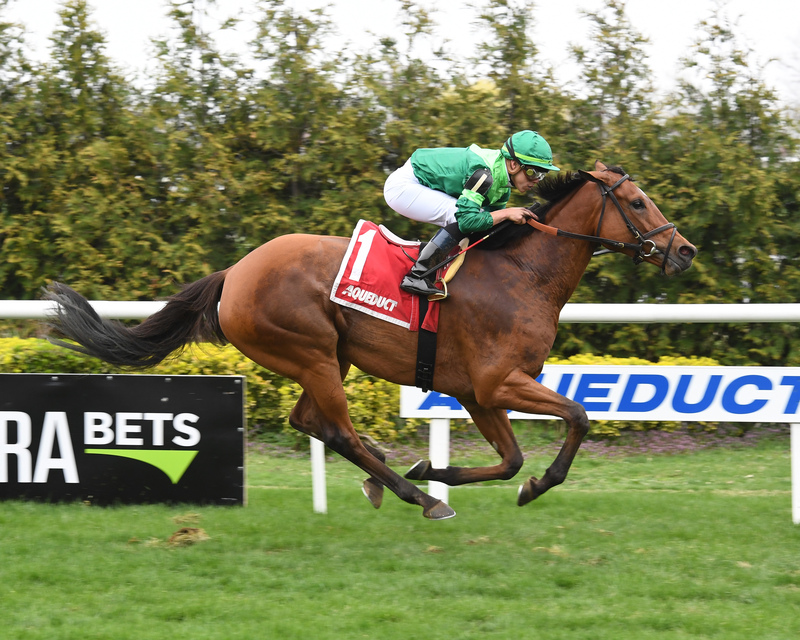 Sent off at 14-1 odds in the field of 10, Monaghan won in a final time of 1:45.50 on the “good” outer turf course to give Franco his third victory of the day in Sunday’s sixth race. Awesome Adversary, sent off at odds of 5-1 with Hector Diaz Jr. up, finished second, 2 ¼ lengths clear of Legion Storm, the 9-5 favorite on the rail ridden by Dylan Davis. Mr. Vincent, who was racing with an aluminum pad off and was sent off at 7-2 odds under Jose Lezcano, finished fourth one length behind Legion Storm. Mrs. Gerald Nielsen bred Monaghan, a son of Desert Party out of Dancing for Glory by Exchange Rate who is trained by Michelle Nevin. Monaghan was making just his third career start after finishing eighth and tenth on dirt. Nevin freshened Monaghan, switched surfaces and changed jockeys to Franco, who delivered a flawless ride. Franco let Monaghan settle far off the pace set by 30-1 Ticked All Deboxes and Samuel Camacho Jr., who took the field to a half-mile in :48.36. Ticked All Deboxes took a narrow lead into the far turn as Monaghan began passing rivals quickly on the extreme outside. Monaghan sustained his rally, took over in early stretch and drew away impressively. In Sunday’s finale, a mile-and-a-sixteenth $41,000 New York-bred maiden $40,000 claimer on the grass, Kendrick Carmouche rallied Edition Farm’s homebred four-year-old gelding Riendo from off the pace to a 2 ½-length victory, giving trainer Rick Schosberg his second win of the afternoon. Sent off at 5-1 odds in the field of 10, Riendo won in a final time of 1:45.75. 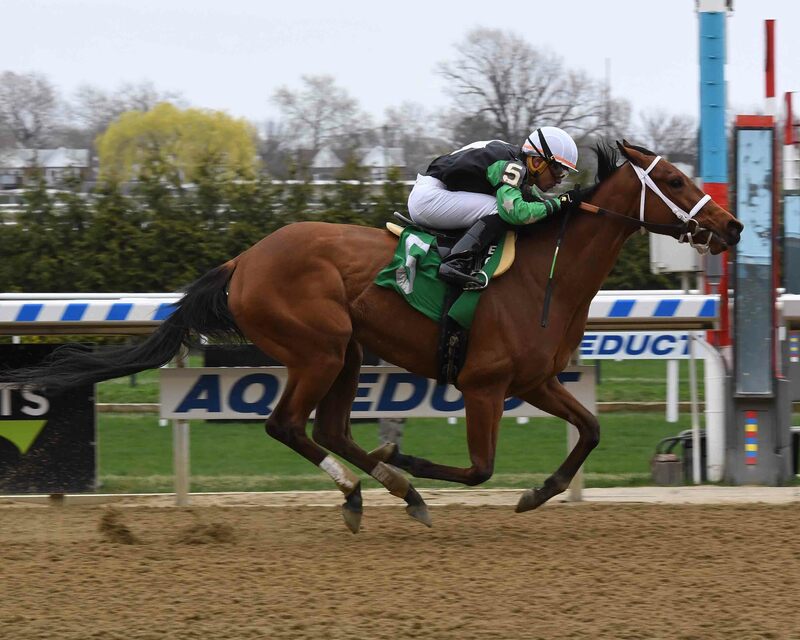 My Amanjena, who went off at odds of 2-1 under Irad Ortiz Jr., nosed Impazible Odds, the 9-5 favorite on the rail ridden by Junior Alvarado, for second. Millionaire Joe, sent off at 21-1 odds with Eric Cancel riding, finished just another neck back in fourth. Post time for the finale was moved up five minutes due to dense fog. Blessed Honour, who went off at 69-1 odds under seven-pound apprentice Benjamin Hernandez, set at least part of the pace, taking the field to three-quarters of a mile in 1:14.32. When the front end collapsed, Riendo took advantage, powering to the lead and drawing away. 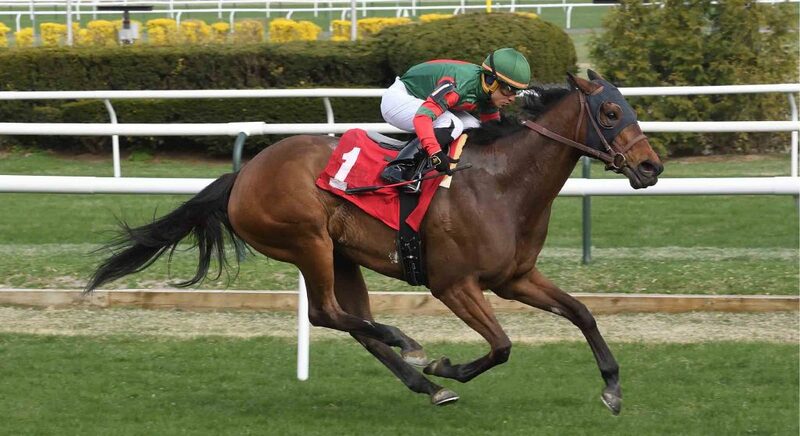 Riendo is now one-for-12 on grass with one second and earnings of more than $30,000. In an eye-popping debut under Jose Lezcano, Beach Haven Thoroughbreds’ three-year-old filly Newly Minted rushed up the rail to take the lead from fellow firster Doll, put that rival away and drew off, taking a six-furlong $62,000 New York-bred maiden special weight by 5 ¾ lengths. 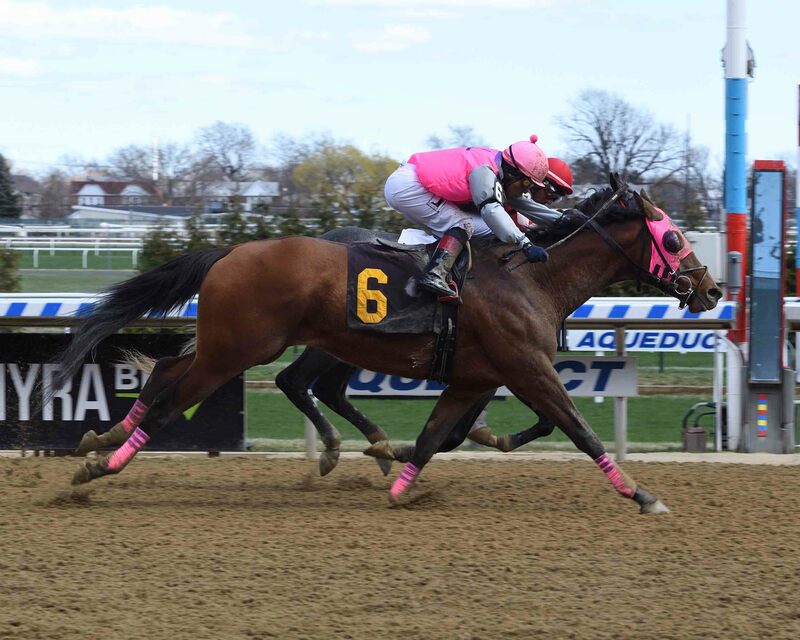 Sent off at 8-1 odds in the field of eight, Newly Minted won in a final time of 1:11.38 to give Lezcano his second winner of the afternoon Saturday at Aqueduct. Bank Examiner, who went off at odds of 2-1 with Junior Alvarado up, finished second, a length and a half clear of Doll, also sent off at 2-1 odds from the outside post under Manny Franco. Yet another first-time starter, 6-1 Singular Sensation and Joe Bravo, checked in fourth, 6 ¼ lengths behind Doll. Chester and Mary Broman bred Newly Minted, a daughter of Central Banker out of Newbie by Bernardini who sold for $110,000 as a two-year-old in April 2018 and is trained by Linda Rice. Newly Minted had seven works for her debut, none of them particularly fast, which may have been reflected in her odds. Using the rail to her advantage, Newly Minted broke second, then rushed up to gain a neck lead on Doll, who broke on top, through a :22.67 first quarter-mile. Newly Minted edged away to a half-length advantage after a half-mile in :46.79, then took off, quickly opening a gaping lead. She was in-hand late in a powerful performance. 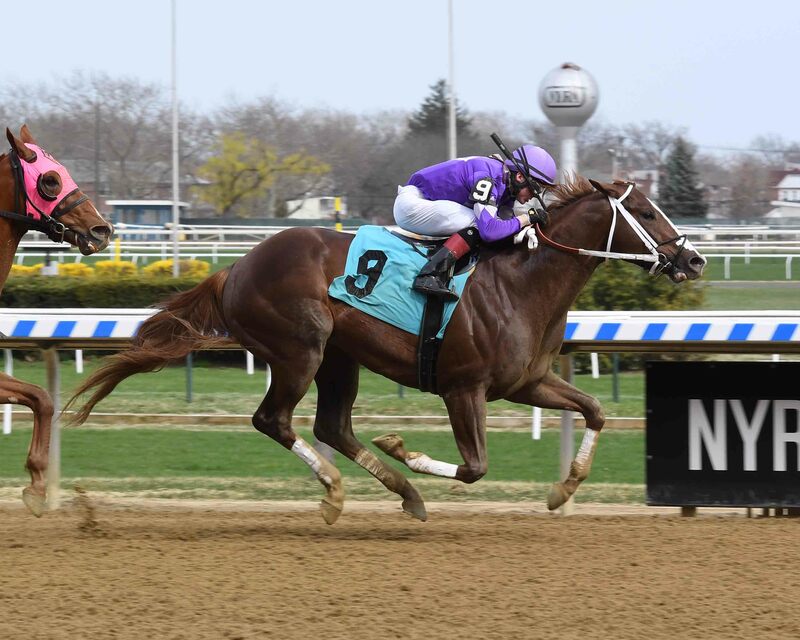 In Saturday’s finale, a six-furlong $41,000 New York-bred maiden $40,000 claimer switched from the turf to the muddy main track, Kendrick Carmouche rallied Ivery Sisters Racing’s three-year-old colt Nueva York up the rail to a 2 ½-length victory. Sent off at 5-2 odds with blinkers removed in a field of six, Nueva York won in a final time of 1:12.74. First-time starter Adios Amigos, who also went off at odds of 5-2 with Joe Bravo riding, finished second, three lengths clear of front-running 7-2 Suremoney and seven-pound apprentice Benjamin Hernandez. The Grand Canal, the 2-1 favorite ridden by Jose Lezcano, finished fourth, 3 ¼ lengths behind Suremoney. Off the Hook Partners bred Nueva York, a son of Flatter out of Pondside by Forestry who was claimed for $30,000 when he finished fourth at 15-1 odds under Reylu Gutierrez on January 26th. 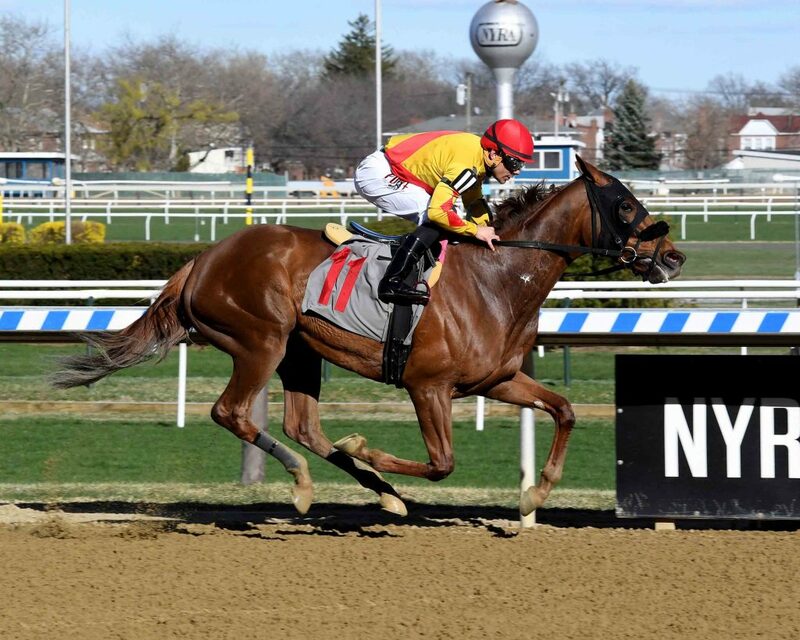 New trainer David Cannizzo added blinkers, and Nueva York finished a distant fifth under Gutierrez in a maiden special weight on February 22nd. 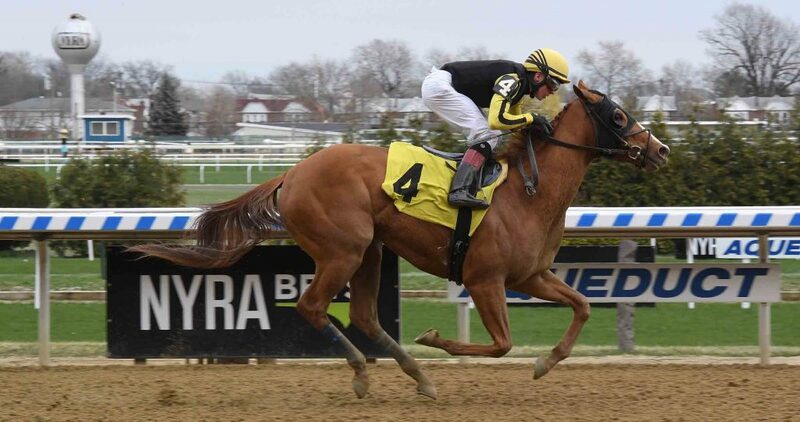 Cannizzo freshened his colt, removed blinkers, dropped him back into a maiden claimer and changed riders. Carmouche settled Nueva York in fourth as Suremoney took the field to a first quarter-mile in :22.61 and a half-mile in :47.14. Then Nueva York gained on the rail as Adios Amigos advanced on the outside. 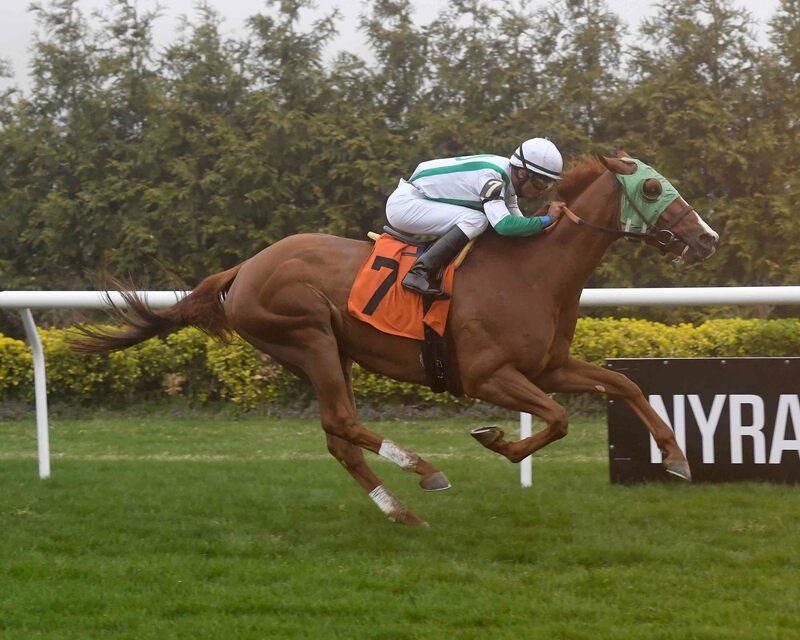 Nueva York took the lead and opened up late to break his maiden in just his fourth career start. Coolboy, who went off at odds of 5-1 under Junior Alvarado, rallied to be a clear second, nine lengths ahead of Central Time, sent off at 80-1 odds under Samuel Camacho Jr. Wilson’s Holiday, a 28-1 shot ridden by seven-pound apprentice Joey Martinez, finished a distant fourth. Ron Lombardi bred Morgantown, a son of Bustin Stones out of Wv Mountain Mama by More Than Ready who is trained by Kelly Breen. Morgantown’s final of five workouts for his debut was a solid six furlongs at Palm Meadows in 1:15 4/5. Morgantown shot to the lead like a seasoned pro, leading Central Time by a head after an opening quarter-mile in :22.40. He stretched the lead to a half-length by running a half-mile in :46.79, then drew away as Central Time tired and Coolboy rallied into second. Morgantown held him safe all the way to the wire. 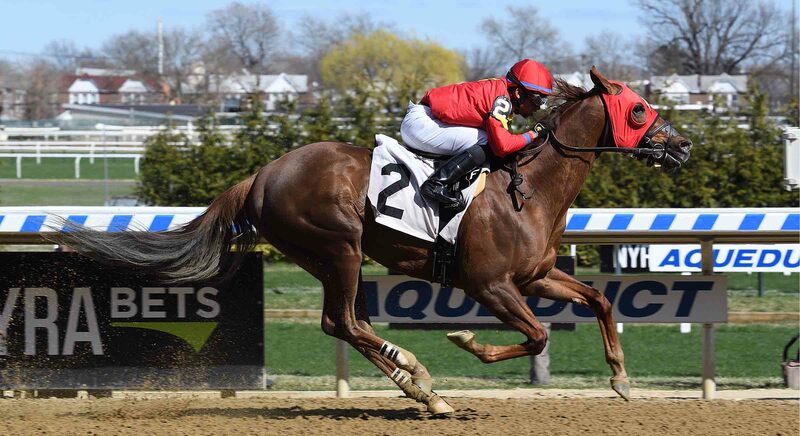 Chester and Mary Broman’s idle homebred four-year-old gelding Fast Getaway, the 9-5 second choice in a field of eight under Jose Lezcano, took charge past mid-stretch and went on to a length-and-a-quarter victory in a six-furlong $66,000 New York-bred grass allowance, giving Lezcano his third winner of the day Friday. Fast Getaway won in a final time of 1:08.97 on the “firm” outer turf course. Mystical Song, sent off at odds of 6-1 from the outside post under seven-pound apprentice Benjamin Hernandez, finished second, 3 ¼ lengths ahead of 51-1 Bettor Bank On It and Dylan Davis. There was a length-and-a-quarter gap back to 9-2 Shamrock Kid and Kendrick Carmouche in fourth. Linda Rice trains Fast Getaway, a son of Into Mischief out of Stolen Star by Cat Thief who was nosed in his prior start on October 25th. Rice did an outstanding job getting him ready for his first start in more than 5 ½ months. Lezcano had her forwardly placed early as 68-1 Lohengrin Two and Oscar Gomez took the field to a fast first quarter-mile in :21.94. Then Big Engine, the 8-5 favorite on the rail ridden by Manny Franco, took over, hitting the half-mile in :44.95. When the front end collapsed, Fast Getaway took the lead, edging away to a handy victory. 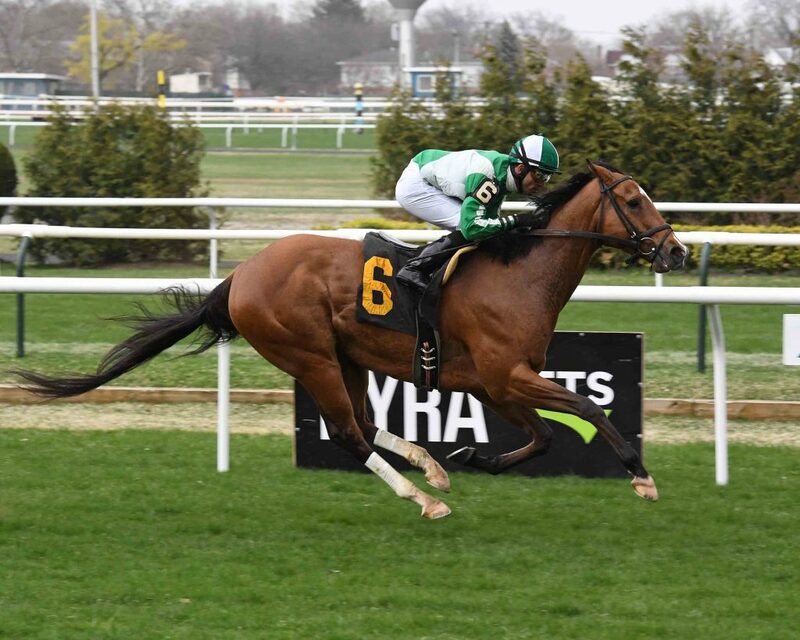 Fast Getaway is now two-for-four on turf with one second and earnings of more than $95,000. 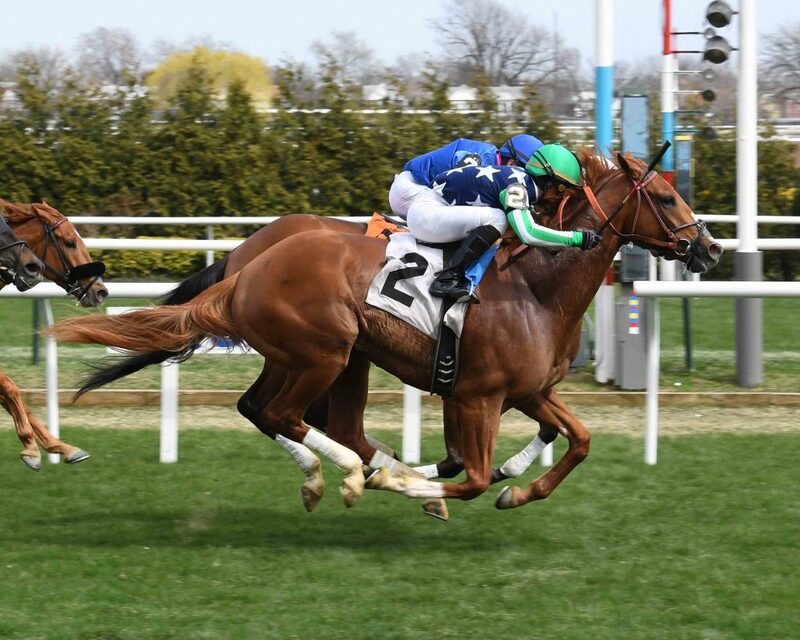 In Friday’s finale, a mile-and-a-sixteenth $41,000 New York-bred maiden $40,000 claimer on the grass, Thomas Thienel’s idle homebred five-year-old mare Grand Banks and Junior Alvarado ran down front-running longshot Sweet Breeze and Samuel Jiminez on the way to a 2 ¾-length victory. Sent off at 3-1 odds in the field of 10, Grand Banks won in a final time of 1:45.06 on the “firm” inner turf course. Handle With Care, sent off at 3-1 odds under Kendrick Carmouche, finished second, a length and three-quarters ahead of 4-1 Two Graces and Eric Cancel. Middle Out, who went off at odds of 2-1 under Manny Franco, finished fourth, another half-length back. John Verrino co-bred Grand Banks, a daughter of Paddy O’ Prado out of Far and Away by Strong Hope who is now trained by Jim Bond. Grand Banks hadn’t raced since December 8th, when she finished a distant fifth under Alvarado at 6-1 odds for trainer Jeremiah Englehart. On Friday, Alvarado settled Grand Banks in third as 99-1 Sweet Breeze and Samuel Jiminez took the field to three-quarters of a mile in 1:14.40. Then Grand Banks took over, opened a comfortable lead and won easily. 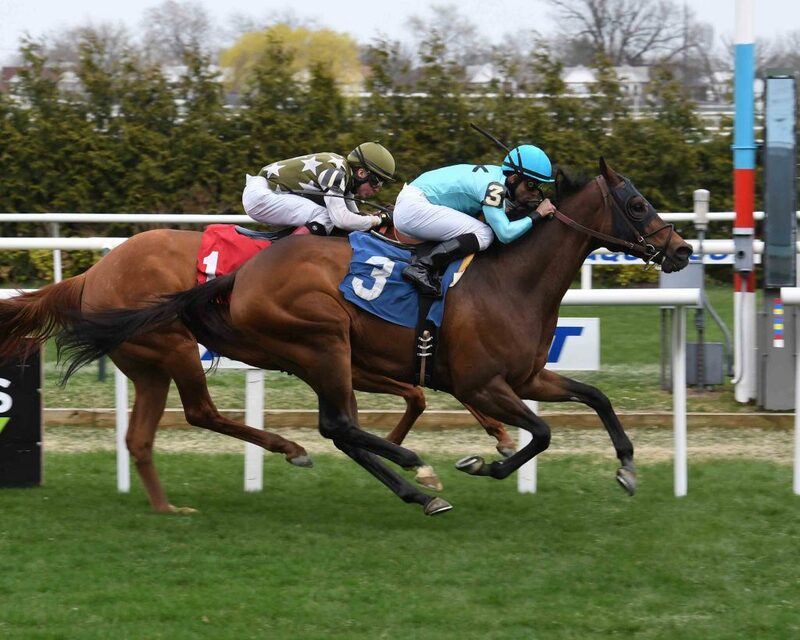 Grand Banks improved her grass record to one-for-16 with five seconds and a pair of thirds. She also has one second and two thirds from nine dirt starts, for total earnings of more than $115,000.